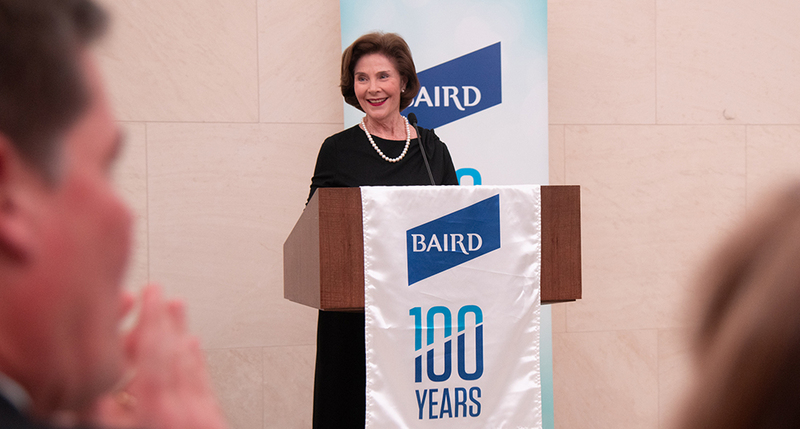 In March, Baird hosted more than 300 guests for a 100th anniversary celebration at the George W. Bush Presidential Center on the Southern Methodist University ("SMU") campus in Dallas. Former First Lady Laura Bush was the guest of honor and featured speaker. The event began with opening remarks from Paul Purcell, Baird Chairman, and Steve Booth, Baird President & CEO. Both reflected upon the significance of Baird's 100th anniversary and the unique culture that has been so integral to the firm's success. Booth, an SMU alum, also expressed his enthusiasm for being back at his alma mater before introducing Mrs. Bush. Mrs. Bush, who also attended SMU, captivated the audience with her stories about special moments from her and her family's time in the White House. She also shared her perspectives on the museum's new exhibit, Away From the White House: Presidential Retreats," which showcased how various presidential retreats are used for work, rejuvenation and rest. Mrs. Bush shared stories about how her husband, President George W. Bush, used Camp David as both a spot for leisure away from the White House and a place where he invited world leaders to forge relationships in a less formal setting. She concluded her remarks with updates on each member of the Bush family and thanked Baird for hosting a wonderful event. After Mrs. Bush’s speech, guests were given the opportunity to explore the new exhibit and the rest of the museum, which highlighted the biggest moments of George W. Bush's presidency. For more highlights from Baird’s continuing 100th anniversary celebration, visit Baird100.com.